My first exposure to this set was during a session in the MusicWeb International Listening Studio. My colleagues and I listened to the opening of the Fourth Symphony and we unanimously found Mikhail Pletnev’s way with the music seriously disappointing. Our disappointment was all the greater when we then listened to the same passage in the symphony conducted by Andris Nelsons. I had been asked to review both discs and I was deeply impressed by the Nelsons recording (review). As a result, I made a conscious decision not to listen any more to the Pletnev until a gap of some weeks had elapsed; I hoped thereby to approach a full review of it as freshly as possible. Well, now the time has arrived and I’m afraid that detailed listening to the whole performance of the Fourth has largely confirmed that first impressions were valid. It will be noted that Pletnev takes nearly 75 minutes to play the symphony. That’s an unprecedented span in my experience: Nelsons’ timing of 64:27 is more representative. Pletnev spins the big first movement out over an astonishing 33:56 – Nelsons takes 26:43 - and I have to say that when you listen to the movement it feels very long. The speed at which Pletnev begins the movement is heavy and ponderous. I don’t know what’s behind his approach to the music. Perhaps he feels that it needs a broad speed in order to bring out the angst. That may be so, but I’m afraid the end result is to blunt Shostakovich’s radicalism. The first time I heard the opening of the symphony I described it as “dogged and lumbering” and I’m afraid further listening hasn’t altered that opinion; if anything, it has strengthened my view. To be brutally frank, I’d wearied of Pletnev’s laboured way with the music by about 11:00 – and then I realised he was only one third of the way through the movement! Rather to my surprise, he picks up the pace at around 17:30 for an acidly perky passage for the woodwind which precedes the furious fugue for the strings. This fugue is quite well done, though it’s nowhere near as electrifying as in the Nelsons performance. The big climax at 22;00 and the build-up to it are very intense. Sadly, though, around 24:00 Pletnev reverts to his very slow pacing and any tension is dissipated. I thought this fundamentally misconceived traversal of the movement would never end. The central scherzo is taken at a pace which is a notch or two below what I’d expect, though the playing of the RNO is excellent. The tempo is such that the composer’s pithy, sardonic mood is compromised. Indeed, the music actually sounds rather well-mannered. I like the account of the opening Largo passage of the finale. Pletnev imparts an appropriately slow, implacable tread to the music and he builds the music impressively. His speed for the main Allegro (from 6:51) is steadier than the pace adopted by Nelsons but initially I thought this would work. However, as the movement progressed I began to feel a decided lack of tension. This is particularly noticeable in the section beginning around 13:00 and, again, shortly afterwards in the extended passage that prominently features the bassoon. All this music emerges as under-cooked and too civilised in Pletnev’s hands; I discern little edge in the performance, well-played though it is. In fact, it all seems a bit polite. All this means that when the huge extended climax arrives (22:35-25:04), it seems to come out of nowhere on account of the preceding lack of tension. The climax itself is powerfully delivered on its own terms but seems to me to lack true urgency. Lacking the fear factor, it is “just” a climax. The performance is very well played and is presented in sound that has plenty of impact. It’s a shame that it is an interpretative failure. 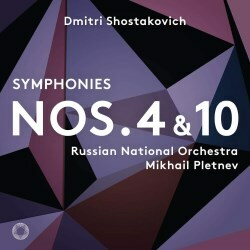 The language and structure of the Tenth is rather more straightforward – though that comment is not meant to diminish in any way the stature of this masterpiece – and I find Pletnev’s interpretation rather more convincing. He does the big first movement very well. He paces the music convincingly and he controls and shapes the movement with purpose. The short, explosive second movement also comes off well; here Pletnev successfully combines weight of tone and urgency. The start of the slow movement is well-measured. After the first appearance of the DSCH motto on solo horn (around 4:00) he keeps the music that follows suitably tense, including during the deliberately ponderous waltz section (from 9:05). I have something of a reservation about the main climax, though. Pletnev invests the build-up with excellent urgency but the for some reason he broadens the tempo for the climax itself and, for me, he thereby undermines the very tension that he has established. The slow introduction to the finale is well handled and it features eloquent oboe and bassoon solos. When the main allegro is reached (5:20) Pletnev keeps the music on quite a tight rein – arguably the rein is fractionally too tight. I admired Pletnev’s recording ot the Eleventh Symphony (review) so I’m sorry I can’t be more welcoming to this set. The performance of the Tenth is a good one, though not a “best in class”, despite the keen response of the RNO and the good recorded sound. Had the Tenth been issued as a single disc it would have been more competitive but the coupling with the lacklustre account of the Fourth makes it difficult to recommend this package with great enthusiasm.